So, users of the HTC 7 Trophy can look at the Radar in disbelief all they want. Yes, it’s the same phone they’ve been having for a year now. The Radar won’t stare back at them. Although, it’s got a few things to show: unibody, wireless hotspot functionality courtesy of Mango, a better screen and camera (not so much for the wide-angle lens and backlit sensor as the simply better looking photos). Anyway, the Radar is not for anyone looking to upgrade from the Trophy or the Mozart. It’s for new WP7 users whom Mango may’ve had convinced but who’re still not confident enough to take a plunge with something as big as the HTC Titan. And before you dismiss it as "so 2010", consider this. Last year, the first WP7 phones were rubbing shoulders with the flagships. They had the premium hardware but the first-gen software was taking away their competitive edge and putting potential customers off. The HTC Radar doesn’t have to worry about that. And we don’t mean the Mango update. Sure, it has addressed many of the platform’s deficiencies. More importantly though, the Radar is not what you’d call a high-end phone. It’s safe in the midrange, away from the industry’s hard-hitters. And there comes the concept of budget. A year ago, Windows Phone handsets were hard to afford. The minimum system requirements are still in place today but the same kind of hardware just no longer comes at premium prices. In the end, the Radar is a compromise between price and features. And one that had to be made, especially with the emergence of Nokia as a WP7 maker. It’s nearly unheard of for an HTC smartphone to match the price of a Nokia smartphone. That’s one other thing HTC need to take care of. Nokia’s Lumia 710 is one of the Radar’s biggest rivals. In what’s virtually identical packages, the Lumia gets the upper hand with a ClearBlack display (LCD though, not AMOLED), faster 1.4GHz processor and free voice-guided navigation with Nokia Drive. And well, the Lumia and the Radar do cost nearly the same. The Omnia W (Focus Flash in the US) is Samsung’s second-gen WP7 offer in the midrange. The AMOLED screen and 1.4GHz processor are its key advantages over the Radar. We liked the subtle elegance of the Focus Flash in our recent review. It’s got a bit of metal on the chassis too, though not quite the solid unibody of the Radar. 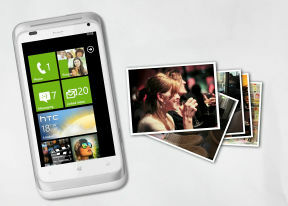 The HTC Radar is a mix-and-match job, which is kind of inevitable if you want a WP7 phone on a budget. It wears the clothes of the Android Desire line, and has the specs of the previous generation of Microsoft-powered smartphones by HTC. The lines have been drawn. It’s now up to HTC to fill in the space between the flagship and the basic package, while keeping a keen eye on the competition. And yes, the HTC Radar is the basic package. But not a bad start for anyone willing to give the new Windows Phone Mango a try.